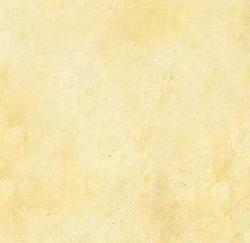 The Landscape as Healer. 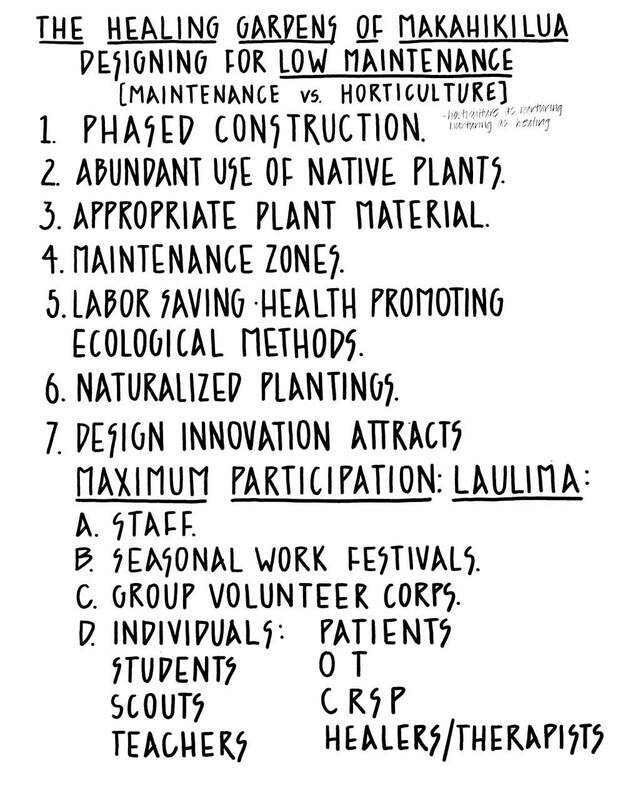 . .
2014 ~ Twenty-five years after its initial conception, and community based design, THE HEALING GARDENS OF MAKAHIKILUA are indeed heading toward a MAKAHIKILUA. 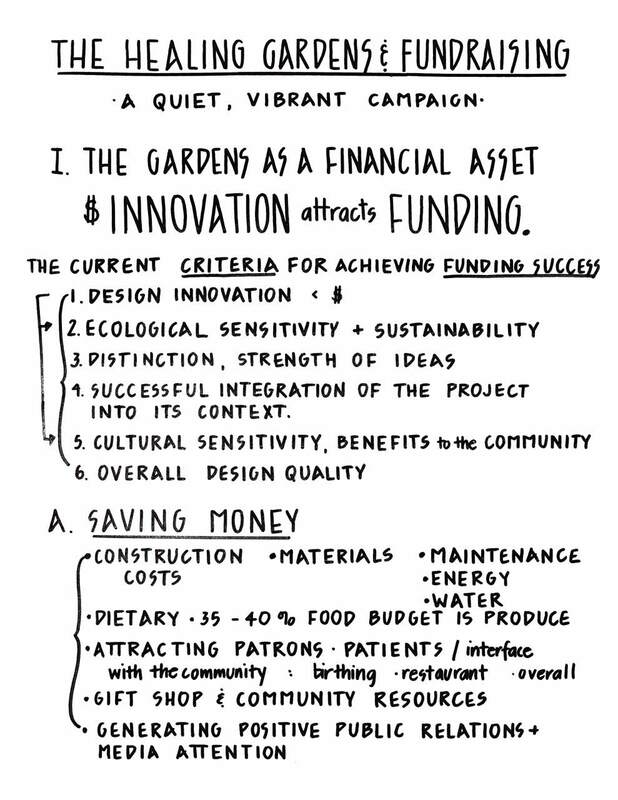 An extraordinary number of Waimea residents participated in the open design process, and the hope of the gardens manifesting is still alive and well in Waimea. 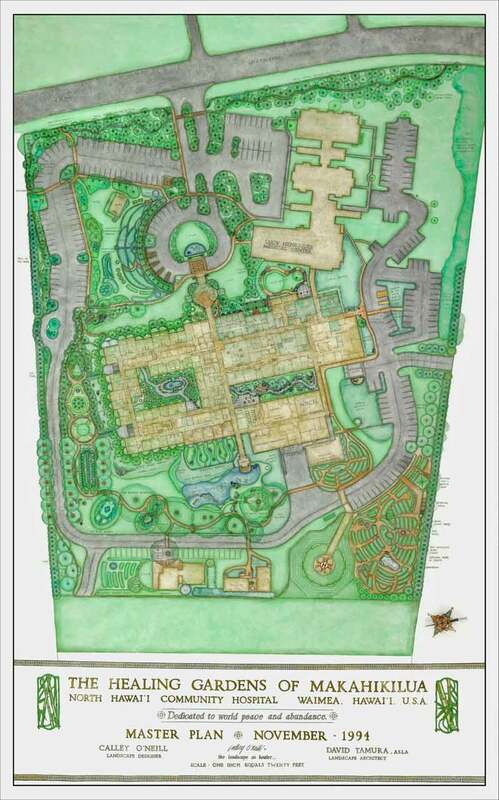 The healing gardens master plan, commissioned by the honorable Dr. Earl Bakken for North Hawai’i Community Hospital, Waimea, Hawai’I Island was never realized due to budgetary restraints and pressing needs at construction time. As the hospital was recently taken over by Queens Medical Center, Calley was recently called in by Arielle Faith Michael, Manager of Holistic Care Services and Mr. Kenneth Graham, President and CEO to present the Master Plan ~ its meaning, intention, elements, and potential for activating the hospitals mission: To increase the health and well being of the people of North Hawai’i. 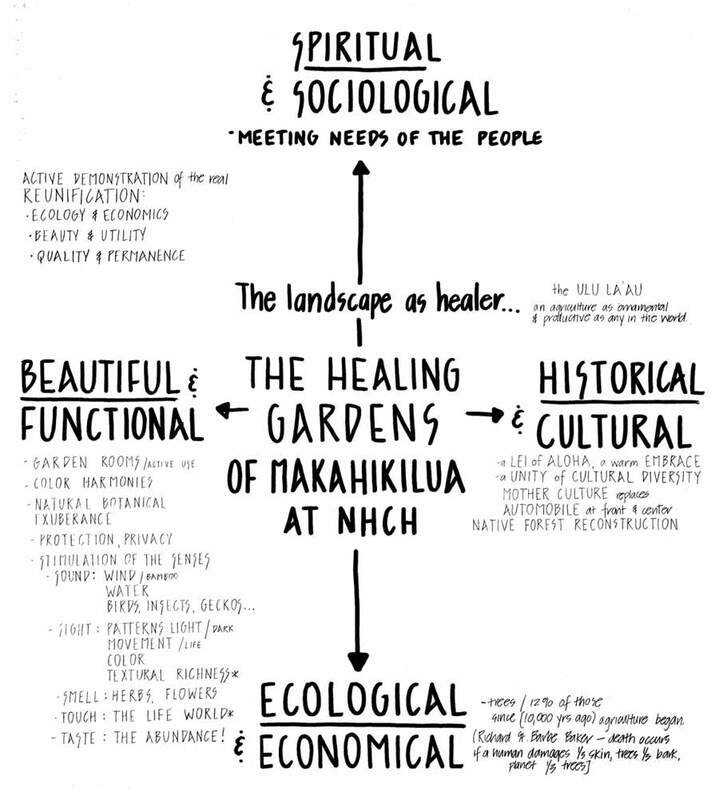 1991 ~ To the best of our knowledge, THE HEALING GARDENS OF MAKAHIKILUA have the potential to become a significant prototype for healing in nature, in that the project is a community based, comprehensive, replicable model of a fine art, ecological landscape incorporating the essential elements of food production, sustainable methods, renewable energy, cultural roots, rare aesthetics and deep healing environments within an institutional framework. Gardening is the sole activity that simultaneously addresses the three primary causes of disease in our time: stress, diet and the environment. The genius loci of MAKAHIKILUA, and the outstanding example of Ancient Hawaiian horticulture is a grand inspiration for a local, multi-ethnic, accessible landscape to demonstrate the necessary reunification of beauty and utility, ecology and economics, quality and permanence – ideals the ancient Indigenous ones could not have conceived of as separate. The landscape will include, over time, an o‘hia (beloved Native Hawaiian forest canopy tree that once proliferated in Waimea) grove reconstruction, a one-acre ethnobotanical and cultural garden with a solar warm floor large halau (a traditional hale or house - for sacred, educational and cultural purposes), a keiki (children’s) garden, and native Hawaiian fern garden, semi-private patient gardens designed according to the ancient principles of Feng Shui for healing and positive energy flow, five private birthing gardens, a bio-intensive mini-farm, medicinal and culinary herb gardens, and spectral garden rooms for color healing work, rejuvenative/therapeutic exercise, prayer and meditation, a chapel garden, two lively courtyards, and numerous renewable energy and human-powered aerobic water elements that round out the Master Plan. 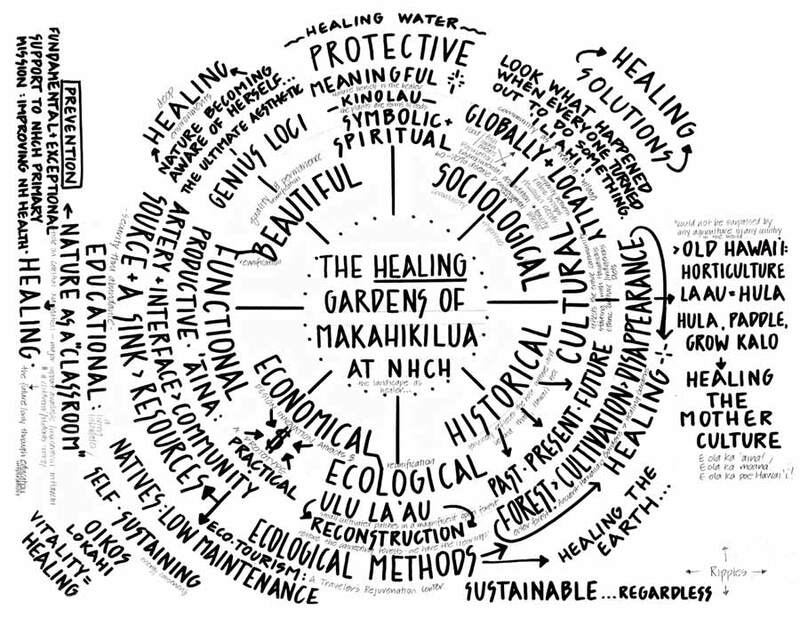 THE HEALING GARDENS OF MAKAHIKILUA will ultimately be a living laboratory for healing the Earth and our people, based on participation, heavy use of the gardens, and a dynamic community education model of hands on workshops, mini-courses, The Landscape as Healer, The Work as Medicine Apprenticeship program, and ongoing practices of yoga, qigong, meditation, hula, tai chi, and other sacred, therapeutic, cultural and healing practices actively filling the gardens. Once the landscape is redesigned for the new and much larger land area, work will proceed in a slow, staged teamwork construction process, with the community component comprising a significant contribution.